Providing 2Gig installations throughout the Greater Vancouver area. Security system technology has advanced by leaps and bounds over the last few decades with the on-set of computers and now wireless and satellite networks have transformed the industry yet again. 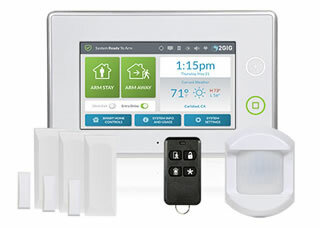 Consumers demand much more from their security system and home automation adds an entirely new level of control for homeowners who are frequently away or who demand the best security system possible to protect their loved ones and their property. ProActive Integrated Security Ltd. is a full service alarm and security company serving Greater Vancouver and the Lower Mainland. We specialize in the sales and installation of 2Gig security and home automation systems and controllers for both residential and commercial clients. Our trade certified technicians are experts on 2Gig security systems, whether it’s a new system installation or a retro-fit of an older system we’ll be able to provide you with an excellent security solution. Still Relying On Plain Old Telephone Service (POTS)? Traditional telephone landlines present various security risks for security system use, such as a someone cutting your phone line, or line damage from a severe storm or accident. Wireless technology utilising existing cellular communication networks is secure, reliable and eliminates the need for a dedicated landline for your security system. With more and more of our clients using smart phones the 2Gig system is an excellent fit and provides a level of control never before possible with plain old telephone service. When you choose to place your 2Gig security and alarm system installation into the hands of ProActive Integrated Security Ltd. you’re partnering with a local team of dedicated and knowledgeable technicians who take the safety and security of your home or business very seriously. If you’d like to request an estimate for a 2Gig security system installation or home automation controller from ProActive Integrated Security Ltd. please give us a call (604) 522-2121 or fill out our contact form and someone will get right back to you.